Funding Circle Reviews - Is it a Scam or Legit? If you’re looking for a term loan of at least 1 year, Funding Circle has several different options for loans that feature reasonable APRs & the opportunity to pay an origination fee of less than 1%. Funding Circle is a small business lender offering loans to help you acquire real estate, refinance debt, purchase equipment or hire more employees. According to their website, they’ve funded more than $3 billion for small business, an amount that sets them apart from similar SMB-focused companies. We took a look at Funding Circle’s Crunchbase page and discovered the company started in 2010 under the leadership of Samir Desai, Andrew mullinger, Alex Tonelli and James Meekings. At the time of publishing, Desai was the company’s CEO and Mullinger was the company’s director. Funding Circle started in London but serves small businesses in the United States, as well. 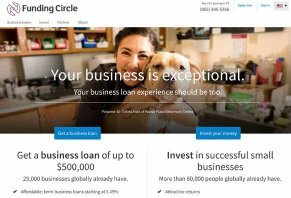 Crunchbase notes that Funding Circle has raised more than $370 million in funding, an amount that puts the company in the upper echelon of small business lenders we’ve reviewed. Funding Circle seems to have the capital and the global experience to be a solid small business lender, but do they live up to the hype? Once we work through each of these topics, we’ll take a few minutes to sum up Funding Circle’s pros and cons, as well as providing you an idea of which kind of business owner would be a good fit for the company’s loan products. As we mentioned in the introduction to this review, Funding Circle disburses loans to companies who are looking to borrow money for four specific areas: real estate, debt refinancing, buying supplies or hiring. Regardless of the reason why you’re borrowing the money, you’ll be offered what’s known as a fixed-rate term loan, which is industry jargon for: a loan with a set interest rate and a set repayment period. Funding Circle’s term loans vary in length from 1 to 5 years and, depending on your business’ unique situation, can be funded for up to $500,000. If you apply for a loan of more than $300K, you’ll be required to submit different paperwork than you would for a loan under $300K (more on that in a few minutes). There are some distinct advantages to a term loan as compared with other types of small business funding like invoice factoring and merchant cash advances from other lenders. Based on our research, we believe that term loans work in the borrower’s advantage simply because the interest rates are far lower than what you’d get with the other products we mentioned. Funding Circle points this out, too, via a chart that compares various aspects of term loans vs. merchant cash advances. While merchant cash advances seem like an easy solution, they end up costing you over time. As Funding Circle points out, merchant cash advances have no fixed interest rate. Rather, they have “very high rates dependent on credit card sales” and the daily interest rates on these loans can equate to extremely high APRs. Invoice factoring, another type of financing we mentioned earlier, works off a weekly or daily interest rate. It’s not uncommon to see a 1% interest rate on your weekly payments. Doesn’t sound like much, but paying 4% of fees each month on a, let’s say, six-month loan, equal an APR of nearly 50%. Funding Circle certainly isn’t giving you loans for free, but their term loans definitely offer better interest rates than merchant cash advances and invoice factoring. Aside from the fact that your payments are lower with a Funding Circle term loan because they’re spread out over 1-5 years, you also get the advantage of paying back your term loan on a monthly basis. Merchant cash advances take a percentage of your daily credit card sales, while invoice factoring is typically paid back daily or weekly. Another benefit? Term loans have fixed payments, so you know what you’re going to pay every month. In order to complete the Funding Circle loan application, you’ll need to submit specific sets of paperwork that vary based on the size of your loan. The reason why the paperwork requirements are different? Companies who make less than $300K are more of a liability to Funding Circle, so they want to see added proof that you’re running a stable business. Another part of the application process requires that you agree to let the lender put a lien on your business and to make yourself liable for the loan in the event that the business can’t make payments. If you own a construction business, for example, a business lien means that Funding Circle could take some of your heavy equipment in order to make up for your inability to pay your loan back. The same could be said about your own possessions – cars, boats etc. Exactly which pieces of equipment or assists will be subject to a lien should be detailed in your loan contract. According to Funding Circle, their online application takes about 10 minutes to fill out and funds can be deposited into your business account in less than 10 days. However, remember that the initial application you fill out on their site is like a pre-qualification on your mortgage. The numbers and rates aren’t final and you’ll most likely have to provide additional paperwork to your underwriter. The positive side to this, though, is that, according to Funding Circle’s website, you get to work directly with your underwriter. When you work with a bank, you usually correspond with a loan officer who sends your application to underwriting and you never actually talk to the underwriter. Pro tip: Funding Circle does a soft credit check (won’t affect your credit scores) during the application process. Hard checks will only be done for businesses classified as general partnerships. Your APR is going to vary based on your credit history and the length of the loan. Each length of loan has its own range of APRs, with the low-end being the lowest on a 1-year and highest on a 5-year loan. Funding Circle says your late fee will be added to the monthly payment you missed and that the fee will be “passed directly onto investors,” a practice similar to what Prosper does with personal loans and student loan refinancing. In our opinion, we think this wrinkle isn’t very borrower-focused and could, depending on the amount of your monthly payment, encourage investors to invest in loans in which borrowers are projected to make multiple late payments. The Funding Circle reviews by experts other than HighYa are generally positive with a couple of well-known sites praising the lender for fast processing, low fees, transparent advertising and no prepayment penalty. The company gets an A+ rating from the Better Business Bureau. It’s worth noting that, of the six consumer reviews on the BBB page, all six are negative. Some of those complaints indicated a misunderstanding of what a standard loan-application process is like, while other reviewers were annoyed by the constant phone calls they received from Funding Circle. Funding Circle’s fees are very reasonable and transparent. You won’t be penalized for paying early and your origination fee could be as low as 0.99%. Also working to your advantage is that you won’t get a hard credit check if you aren’t a general partnership. Among small business lenders, Funding Circle’s processing time for term loans is average. However, that won’t work for businesses who need cash within days. For these types, a merchant cash advance or invoice factoring might be a better – albeit more expensive – option. Also, we found Funding Circle’s high-end origination fee of 6.99% to more than 25% higher than other small business lenders we’ve review: Bond Street is a good example. We believe Funding Circle’s loans will benefit borrowers who have a long business history, steady revenue and good credit scores. While we can’t vouch for Funding Circle based on personal experience, we do believe, based on our research of this company and others like it, low fees and term loans make Funding Circle a solid choice for funding. If you are unsure about the company, we suggest filling out applications for multiple lenders. Getting a variety of quotes helps gauge interest rates and see which companies offer the best terms. To start, read through our review of Bond Street – it follows the same format as you read here and includes a helpful table that compares it with several other lenders you might want to research. Write a Review for Funding Circle!